Is there anything more perfect than a warm and hearty beef stew on a cold night? Warm up your insides, as well as your family's, with one these scrumptious beef stews. Beef and Guinness stew: Guinness Stout adds gives this hearty beef stew bold flavor, along with bacon, broth, and a variety of vegetables. Slow cooker beef stew: Apple juice and bacon make this a flavorful recipe for beef stew, and it's packed with vegetables. Serve this beef stew with crusty bread or rolls for a delicious everyday meal. Beef and beer stew: This beef stew is made with bacon, stewing beef, herbs, broth, and beer, along with chopped vegetables. It's a delicious, warming beef stew, perfect for cool weather. Old-fashioned beef stew: This classic beef stew is made with potatoes and vegetables, along with herbs and seasonings. Mom's homemade beef stew: This is a simple beef stew made with beef shanks, stew beef, and vegetables. Cook the beef shanks a day earlier, then finish the next day. It's a great stew for an everyday family meal with biscuits or crusty bread. Beef and red wine stew: This popular beef stew is a flavorful dish the whole family will enjoy, and it makes a great potluck dish. Beef stew with vegetables: This is a basic old-fashioned beef stew, made with lean stew beef, beef broth, and vegetables. Tangy beef stew: This slow cooker beef stew is a delicious, tangy stew. Serve with noodles for a perfect family meal. Ness's bee stew: This slow cooker beef stew contains tomato soup, along with the beef, vegetables, and seasonings. Curried beef stew: This beef stew is jazzed up with a little curry powder and ginger. It's a delightfully different beef stew. Autumn beef stew: Feel free to add chunks of rutabaga or turnip along with the potatoes or add chunks of sweet potato about 15 minutes before the stew is done. Slow cooked barbecue beef stew: This slow cooker beef stew is made with tomatoes, mushrooms, and a little barbecue sauce, for a distinctive down-home barbecue flavor. Beef and barley stew: A thick and hearty stew made with bacon, stew beef, mushrooms, barley, and vegetables. Serve this flavorful beef stew with crusty rolls or biscuits for a hearty family meal. Slow cooker beef and beer stew: This is a flavorful stew for the slow cooker, and perfect for an everyday family meal. Serve this stew with warm crusty rolls or hot buttered biscuits. Perfect beef stew: This stew is thick and delicious, with plenty of beef and vegetables. It's everything you could possibly want from a beef stew. Country style beef stew: Beef stew with potatoes, carrots, and onions, along with beef broth and seasonings. 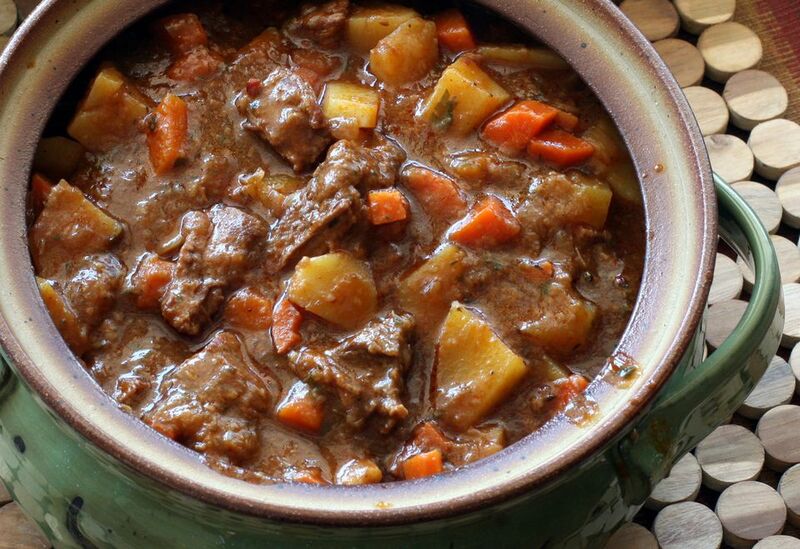 Wagon wheel stew: This slow cooker beef stew is delicious and so easy to prepare. Beef and pinto bean stew: This is a flavorful slow cooked beef stew, a delicious and hearty meal your family will enjoy. Serve this stew with cornbread or muffins, or with crusty rolls or bread. Beef Burgundy: This classic French stew is sure to be a hit with your family on a cold, wintery day. Just throw all the ingredients in a saucepan, let it cook, and you're good to go. Crockpot beef curry: This beef curry is easy to prepare and cooks all day in the slow cooker. Serve this tasty beef curry with rice and a tossed salad for a delicious family meal. Beef stew with beer and mushrooms: This beef stew recipe makes more than 2 quarts of hearty beef stew. Traditional Irish stew: While this recipe uses lamb for an authentic St. Patrick's Day meal, you can substitute it for beef and you've got a perfect Irish stew for a cold day.